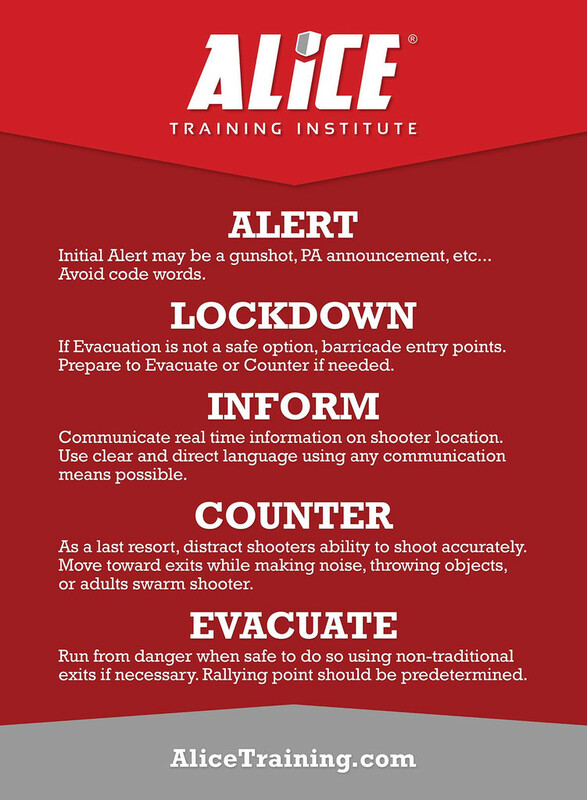 “ALICE” is an acronym for 5 steps you can utilize in order to increase your chances of surviving a surprise attack by an Active Shooter. 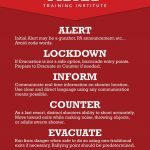 It is important to remember that the “ALICE” response does not follow a set of actions you “shall, must, will” do when confronted with an Active Shooter. While accountability, liability and responsibility is important, in this case, survivability is paramount in this situation. Therefore, a proactive, options-based policy and training is necessary. Individuals may use any or all parts of the response plan. While the ALICE acronym make it easier to remember, it is not sequential or linear. In this type of incident, perception is the reality and individuals must decide for themselves what is in their best interests. Can be anything. No code words. This is a semi-secure starting point from which to make survival decisions. If you decide to not evacuate, secure the room. Tie down the door, if possible, using belts, purse straps, shoelaces, etc. Once secured, do not open the door for anyone. Police will enter the room when the situation is over. However, if information is conveyed that the situation has changed and evacuation is possible, evacuate. Using any means necessary to pass on real time information. This is as a last resort when other options are not available or feasible. This is the use of simple, proactive techniques that will make the Active Shooter’s ability to shoot accurately more difficult. This is not fighting; this is countering the attack. To counter an attack use noise, movement, noise and distraction, and when age-appropriate, the swarm technique to gain back control. If you have control of the shooter, call 911 and tell the police where you are and listen to their commands when officers arrive on scene. Remove yourself from the danger zone as quickly as possible. Do not have anything in your hands. Go directly to the Rally Point. Responding Police will have their weapons drawn and ready for use. They do not know exactly who the shooter is and will probably point weapons at occupants. Just remain calm and follow any directions they may give. Occupants may be asked questions, patted down, and given orders to exit certain ways. If you come into possession of a weapon, DO NOT, carry or brandish it! Police may think you are the Active Shooter. If possible, put it in a trashcan and carry it with you. If you come across Police, calmly tell them what you are carrying and why. Follow their commands. Be prepared to provide first aid. Think outside the box. Tampons and feminine napkins can be used to stop blood loss. Shoelaces and belts can be used to secure tourniquets. Weighted shoes can be tied around a person’s head to immobilize it. Remember it may be several hours until can safely move an injured person. The actions you take immediately to treat them may save their life. Discuss beforehand with people in your office where you will meet up should you have to evacuate and make it a place easily accessible and far away from the scene. Talk to your co-workers beforehand to know if they have any special skills. Consider strategic placement of these people in an office setting. You may have current or ex-military personnel, medically trained persons, or even people trained in martial arts that can provide assistance in this type of incident. These measures are meant to provide you with the knowledge and skills you may need to make decisions for your safety and the safety of the children. There are no mandates on how to survive, you are empowered to make decisions and won’t be second guessed.